Mini Roulette is based on European Roulette but with more favorable odds. Roulette has always been considered a casino classic and when playing online, one will find the standard roulette games as well as a mini game. Mini roulette is basically a European roulette game in a small package with all the outside bets being the same. Mini roulette is still a game of chance that will require a bit of luck to be a winner. With a number of leading online casinos now offering this version of roulette, it has become a popular choice for many, including those that are new to online roulette games. The rules for mini roulette are the same as with standard roulette. The goal of the game is to predict where the ball will land after the wheel is spun. Players will place their wagers on the roulette table and once all bets are placed, the wheel will be set in motion. Players will have the ability to place all of the standard roulette bets, including straight bets, splits, street bets, corner bets, red/black and odd/even. The result of the game is announced and all payouts are offered automatically. 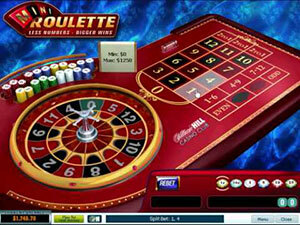 There are no special rules or strategies that are used with mini roulette. One difference is that if the ball lands on zero, half of the wager is returned to the player. The bets in the game can be placed on numbers or a combination of the numbers in use. With Mini roulette, there are fewer numbers in play, so the game is actually easier to play and betting is simplified. The main differences between mini and regular roulette lies in the table layout and the smaller format of the wheel in play. The betting structure will also differ since there are fewer numbers in play. The mini roulette game only uses 13 slots on the wheel in comparison to the 36 with the European version of standard roulette. As mentioned, the payout for a zero will be different than in the regular game. With mini roulette, this results in a return of half the bet. The payouts for bets placed also differ. All of the payouts can be seen when accessing the mini roulette game and hovering over certain areas of the table. Another difference will be noted with the house edge. When playing mini roulette, the game has one of the highest house edges of all roulette games online. The mini offer a 7.69% house edge where the standard European roulette game has a house edge of 2.7%. Those that appreciate the excitement of roulette will surely enjoy this simplified version of Roulette too. With this game, players will enjoy all the same roulette betting options as usual but with odds that more in your favour since it only has 13 numbers on the wheel. The best option to play the game right now is with a casino powered by either Playtech or Netent. Our top choices for casinos that offer Mini Roulette would be: Bet365 (see our review) and William Hill Casino (see our review).